It should not surprise us that, given the circumstances of his incarceration and particularly the draconian ban on any form of writing, we know almost nothing with any certainty of the genesis of the few poems he managed to write and smuggle out during his imprisonment. The two poems that became famous almost the moment they were published and which are the only poems of Schubart that would ever be found in anthologies for the general reader of today arose during this period. Schubart's son, Ludwig, in his memoir Schubarts Karakter, 'Schubart's Character', stated that Schubart wrote Die Fürstengruft, 'The Crypt of Princes', in a fit of bitter anger at Carl Eugen, who had apparently led him to expect his release and then just autocratically left him dangling. This was in 1780, and such teases would be a recurrent event for seven more years until he was finally released in 1787, ten years after his arrest. 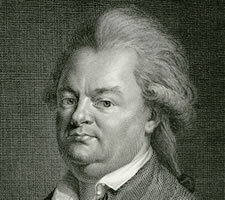 Ludwig tells us that Schubart had already got the idea for Die Fürstengruft when he was in Munich in 1773 and had other targets of his anger. He had carried the idea around with him on his wanderings since then until the moment that his rage at Carl Eugen brought it to paper. We are told that Schubart dictated the poem to the servant who brought him his food and supplies. This may have been Captain Pfeiffle, who had been put in immediate charge of Schubart in 1779. Pfeiffle's role as a communications channel was never mentioned openly by Schubart or Helene, for obvious reasons, and whilst the Duke was still alive it was clearly better for Ludwig to use the vague term 'servant' in his account. This fact, as I know with certainty, contributed much to the continuance of his imprisonment. Just as it had done through his life so far, so now Schubart's wild and impetuous nature had made his situation much worse. What did Carl Eugen find so offensive in 88 lines of the poem? A better question would be: what didn't he? See the piles of rubble that were once proud princes, once the idols of their world! How dimly glow the great silver shields, the princes' last pride! On their urns marble spirits weep stone tears, chiselled into the marble by a laughing French sculptor. Skulls with extinguished eyes that once looked down threateningly from on high, life and death hanging on their nod; now rotted to the bones the hand that often with a cold stroke of the pen chained up the wise ones who had spoken too loudly at the throne; now just ribs the breast once wrapped in gold cloth and decorations. Dried and shrunken the channels where lustful blood once flowed like fire. Gone deaf the ears into which courtiers whispered awed flatteries! No longer does he stand to smile to your applause, nor whinnies laughter at smutty jokes, fanned by chambermaids with painted faces, as shameless and prurient as he. Now they lie, sleeping the iron sleep, the scourge of men, unwept! In the stone grave, lower than slaves walled into the dungeon. Those who in their brazen bosoms never felt the fear of religion and who held righteous, better men for cattle, intended only for hard labour. Those who drowned out the voice of their conscience with drumming, French pipers and hunting noise. Who valued only dogs, horses and loose women, while squeezing genius and wisdom. Let nothing wake them! Not your groans, you hordes they made poor; not the crowing of the ravens; not the wailing of the pale orphan boy, his father taken by a tyrant; not the curses of the cripple on his staff, lamed in foreign service. The thunder of the Last Judgement will break over them soon enough, when the Angels of Death grasp the tyrants woken by the dreadful judge, and heaps their horrors into a flaming mountain that covers them. There is one clever play on words: durchlauchtige Gerippe, 'radiant/see-through bones'. Durch­lauch­tig, usually translated as 'radiant' or 'serene' is traditionally used as a term of respect for great aristocrats. Here, in the crypt of princes, it is applied to an aristocratic skeleton, which brings to mind its original, etymological meaning of light shining through something, in this case the skeleton of the aristocrat himself. Apart from this there is little subtlety, just naked invective. We should spare a thought here for the feelings of the underling charged with declaiming this poem to Carl Eugen. 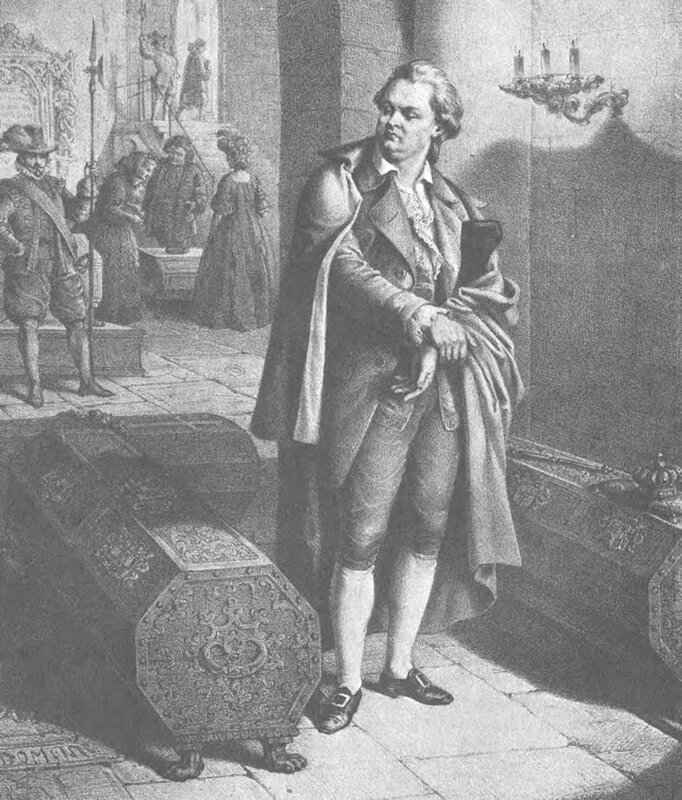 Schubart in der Fürstengruft, 'Schubart in the Crypt of Princes'. Lithograph by Bonaventura Weiß, printed by Gottfried Küstner in Stuttgart, published by Eli Merkel in Ravensburg, mid-19th century. Image: Württembergische Landesbibliothek, Stuttgart. This is the true voice of the author of the Deutsche Chronik, who had finely honed the blade of ironical persiflage. The final lines take us to the Last Judgement, at which God tells these 'better princes' to keep their crowns for eternity because they have deserved them. Except… that Schubart's mind was perfectly capable of demonising Carl Eugen and praising Friedrich II, who would presumably be one of the 'better princes'. We'll let the idea that these last lines are merely camouflage stand, but with a health warning. Die Forelle and Die Fürstengruft were not the only poems of Schubart's smuggled out of Hohenasperg; soon a number were in circulation. The slips of paper bearing poems 'flew like gossamer threads from the prison'. These 'gossamer threads' – his poems and also his musical settings of some of them – found their way into published anthologies, most importantly the Schwäbische Musenalmenach, where his texts were printed under the pseudonym 'T' and his music under the pseudonym 'Buxtehude'. [Holzer 116]. Schubart asked permission of the Duke to produce a definitive version of his collected poems. Once the cat was out of the bag Carl Eugen was advised to make the best of a bad job and to publish the poems officially, using the printer to the court. Most of the profits of this venture would therefore flow to the Duke. In that collection only Die Forelle and Die Fürstengruft stand out for their anger. Die Forelle was rescued from oblivion by Franz Schubert's music, who also set three more of the 'prison poems' to music around 1816: D 342, An mein Klavier, D 454, Grablied auf einen Soldaten and D 518, Lied an den Tod. There is, however, a limit to what even Franz Schubert can achieve in these three. Die Fürstengruft found its way onto the reading lists of generations of German schoolchildren. It is astonishing that the final 16 'camouflage' lines are included without further comment in most anthologies of the poem. But then, if it had not been for Franz Schubert's expertly wielded knife, Die Forelle would also be reproduced exclusively as a four stanza poem. All the other poems are the usual rococo encomia on this or that – for the modern person the poems are unreadable. There are a number of pieces glorifying Rieger, including an inscription for his tomb, and also poems on the death of General Schelling, Rieger's successor. The collection was sent to a censorship commission, which, as censorship commissions invariably do, objected to a number of transgressions in the work. [Briefe 2:129, 12 May 1785] Driven by his usual desperation for cash Carl Eugen even chose to let these places in the text stand, thus increasing the attraction of the book, its sales and his income. Notably though, Carl Eugen refused to let Schubart dedicate the book to him, since that would have 'authorised' the work and would have made Schubart's further incarceration untenable. The poems were published in 1786. Over the ten years of his imprisonment Schubart's conditions had improved considerably. The first year, 1777, had been the awful year in the dungeon. The following years had brought their own sort of despair but also physical and mental ameliorations for Schubart. The death of Rieger in 1782 marked the real turning of the tide, in that Zilling and Rieger's Pietist project for the brain-washing and re-education of Schubart came to an end. He had a series of humane commanders, relatively unrestricted freedom of the fortress, conviviality with others, visits, letters, better food and, above all, wine. A collection of his poems had been produced and printed on Carl Eugen's presses. By 1786 his imprisonment was becoming a farce. In May of the following year he was freed.